Ekiti State University Teaching Hospital, EKSUTH school of nursing admission form for the 2018/2019 academic session is out. I have a student who have graduated from a nursing School and wish to further still in medical line, what would be your advice i.e,which school and course can she apply for? 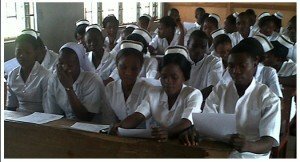 Comment Text* : Hello sir/ma,pls what is the limit age for nursing applicants. Comment Text*please I want to know when eksuth will release their result and how to check it. what of School Of Nursing Birnin Kudu? @Bala, there is no update on that yet.